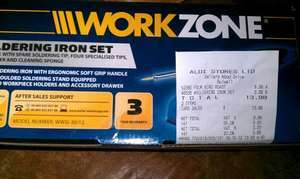 30w Workzone soldering iron set at Aldi. Sticker price £6.99, scanned at just £3.99!! Comes with soft grip handle, spare tip, four specialist tips, 20g solder, stand and cleaning sponge. Not sure if local or national. Comes with 3 year warrenty too! Ideal stocking filler for any budding hobbiest!! Deal posting newbie! This is jaffanator first deal post. Help out by leaving a posting tip or just to show your appreciation for their contribution.